What’s the best part about summer? The weather? The beach? In my opinion, it’s the abundance of fresh local fruit and veggies. I find Farmers Markets and seasonal produce more and more important (and fun!) with each passing year. Freshness can make all the difference in a good meal or dessert. For example, have you tasted a farmers market strawberry against a store bought one? They don’t even taste like the same fruit. A farmers market strawberry is so much sweeter and juicier, you will never want to buy that plastic container of grocery store ones ever again. 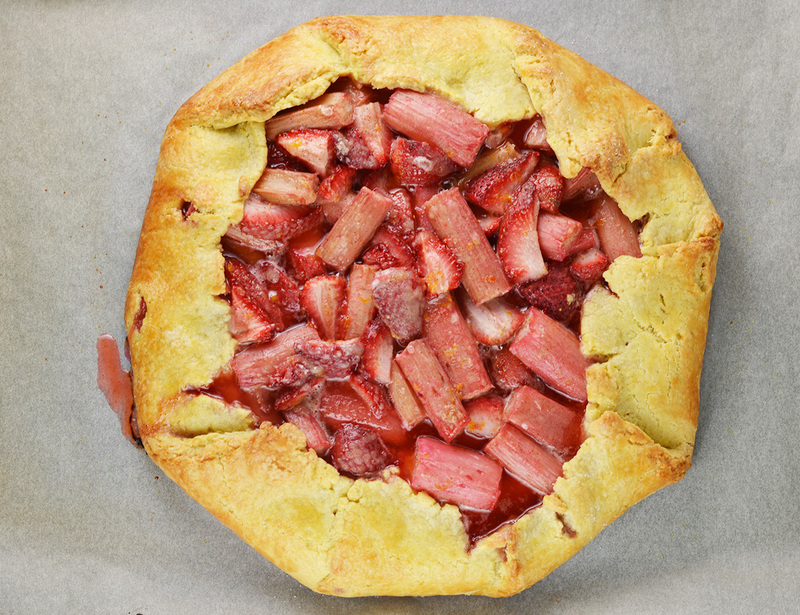 In season strawberries and remaining spring rhubarb is one of the best seasonal pie combinations around. I usually make a strawberry rhubarb pie or crisp every spring or summer. This year I decided to go with a crostata, the rustic Italian friend of the American pie. The crust of this crostata is my favorite, always reliable rich tart pastry dough recipe from “The Art of Fine Baking,” by my grandmother Paula Peck. If you read this blog regularly, you’re probably thinking “she’s using that dough again? !” Yes, I’ve used it A LOT but it really is the best. I’ve tried many pie doughs and even learned some good ones from The International Culinary Center. But this rich tart pastry dough beats the others in flavor and versatility, hands down. The richness of the citrus scented dough is the perfect compliment to juicy sweet strawberries and tart rhubarb. No need to worry about lining a pie plate or creating a pretty lattice top, the benefit of a crostata is it’s rustic simplicity. Just roll out the dough, place the filling in the center, and fold up the edges. About 35 minutes later you will have a mouth-watering luscious baked strawberry rhubarb dessert you will repeat seasonally for years to come. Place flour in a bowl. Make a well in the center. Add all ingredients to the well. The butter should not be ice cold, nor should it be so soft that it is oily. With fingertips, make a paste of the center ingredients, gradually incorporating flour to make a smooth, firm ball of dough. Work quickly, so butter does not become oily. When sides of bowl are left clean, the pastry is finished. Wrap in wax paper and chill until dough is firm enough to roll. Line or grease a baking sheet and preheat oven to 400 degrees. Mix together, rhubarb, strawberries, sugar, cinnamon sugar, zest, flour, and cornstarch. Roll out pastry on a floured surface until just under 1/4 of an inch thick and at least 11 inches round. Pile filling in the center of the dough round. Fold and pleat dough evenly up around filling. Brush dough with egg milk mixture. Bake 35-40 minutes or until juices are bubbling and the top is lightly browned.